These hand, arm and hip movements form the basis of many Tomiki Aikido techniques. Your hand should form a ‘tegatana’, (literally ‘Hand Sword’ or ‘Hand Blade’) and you should perform the movements as if you had a sword or knife. Concentrate your power through your hand blade. Strikes are performed against an imaginary person of the same height as yourself. The movements should be performed with feeling and speed. The correct way of performing the Tandoku undo hand movements is too a FAST count of 8, finish the move quickly, pause in each position and wait for the next count. Tandoku undo always begins from a neutral posture and all ends in a neutral posture except for number five. Counting should be in Japanese or English. This exercise consists of a strike straight down to the forehead. Keep the tegatana along the centre line of your body and your hips at right angles to the centreline. 1. From a neutral posture, raise your left hand high to jodan. 2. While moving forward with your left foot into left hand posture. 3. Tsugi-ashi backwards and withdraw your hand down to near our belt. 4. 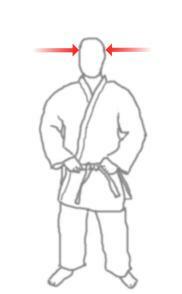 Tsugi-ashi forwards into left posture, hold and return to neutral posture. 5. From a neutral posture, raise your right hand high to jodan. 6. While moving forward with your right foot into right hand posture. 7. Tsugi-ashi backwards and withdraw your hand down to near your belt. 8. 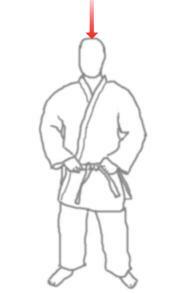 Tsugi-ashi forwards into right posture, hold and return to neutral posture. This exercise consists of strikes to the temple. During the withdrawals of each strike, you should brush the back of your hand against your own head. This would ensure that if you were holding a sword, you don’t attempt to pass the sword through your own body to strike the opponent!. 1. From a neutral posture, raise your left hand high to jodan, Move forward with your left foot into left posture and strike in a wide arc rightwards to your opponent’s left temple with your palm downwards. 2. Tsugi-ashi backwards and withdraw your left hand using the same arc until the back of your hand just touching your head. 3. Tsugi-ashi forward with your left foot forward again, and strike in a left-hand arc with your palm upwards to the right temple. 4. Step back into neutral posture. 5-8. Change to your right hand, and repeat the whole sequence on the opposite side. Third Set of Tandoku undo – Click to play. 1. From a neutral posture, step forward with your left foot. while sweeping your left hand, in a circular arc motion out to your left, finishing with your left hand to your centre chudan level, Palm facing outwards. 2. 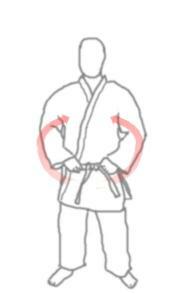 Tsugi-ashi backwards and withdraw your left hand using the same arc until it in your centre palm upwards. 3. Tsugi-ashi forwards while continuing the circular motion across your body to finish in a central chudan level palm upwards. 4. Step back into neutral posture with you left hand to your side. This exercise changes direction by 180 degree from a front attacker to a rear attacker. 1. From a neutral posture, step forward with your right foot to centre turning your foot slightly to the left, while raising your left hand to a chudan centre, palm upwards. 2. Lower your left hand while maintaining your centre, at the same time rotate your hand to palm downwards and move you arm in a circular motion down to a gedan level past your stomach and left hip but keeping it in your own centre. Hip-Turn 180 Degrees into left posture, while continuing the circular motion of your arm until your hand is a chudan level with your palm facing away from your body. 3. Hip-turn back into right posture bringing your arm through the same arc as before, finishing with your palm facing upwards. 5-8. Change to your left foot and right hand, then repeat the whole sequence on the opposite side. This exercise defends from a high sword attack and changes direction by 180 degrees to a second rear attacker. Then defending against a front attack by moving backwards and to the side. 1. From a neutral posture, step forward with your right foot to centre, turning your foot slightly to the left, while raising your left hand to a jodan level. 2. Hip-turn 180 degrees to your left and draw your left foot backwards so that you are in a neutral posture. while at the same time, lower your left hand to your side. 3. From a neutral posture, step forward with your left foot to centre, turning your foot slightly to the right, while raising your right hand to a jodan level. 4. Hip-turn 180 degrees to your right and draw your right foot backwards so that you are in a neutral posture. while at the same time, lower your right hand to your side. 5. From a neutral posture, step back Daigonally with your right foot to your left rear corner, left foot following, at the same time, move your left hand back and down in a circular motion. 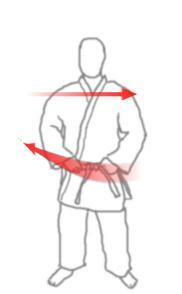 Continue the circular motion of your left hand round and tsugi-ashi forward in a left posture. 6. Step forward with your right foot into neutral position, while lowering your left hand to your side. 7. Step back Daigonally with your left foot to your right rear corner, right foot following, at the same time, move your right hand back and down in a circular motion. Continue the circular motion of your right hand round and tsugi-ashi forward in a right posture. 8. Hold in right posture. After a short pause. Extra Step back into neutral posture. After a pause.